First, I want to thank Whitney Ellenby and The Nonfiction Author Awards for providing me with this book so I may bring this review to you. Warning: you will need a box of tissues handy for this book. Many times, I cried both sad and happy tears. 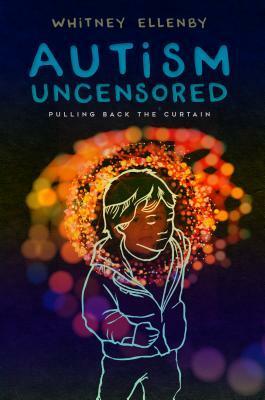 Autism Uncensored Pulling Back the Curtain by Whitney Ellenby is a book that every parent/relative of a child/loved one who is either living with or just been diagnosed with Autism must read! Whitney makes this a very educational read on a personal level through experiences she and her husband went through. She also discusses how these effects every aspect of your life-even marriage. There are tips and suggestions at the end of the book that she has learned along the way to help others. There is also a book referenced as well. I really liked this cover as it stood out to me. The outline of the little boy with the red fog around him was very spot on for what Autistic kids probably feel. I loved how there were quotes from song titles in the book. I found myself singing them instead of reading them however. Each of the lyrics pertained to the topic of the chapter in the book. Whitney poured her heart, soul, and showed her true emotions and it showed big time. It was those scenes that sucked me even more to the book than I was already in. When she found out she was pregnant, the actual diagnosis and what was to happen after. WOW those were dramatic scenes!! Whitney you are an incredible writer!! I wanted to reach out to you and cry with you! There was something in the book that was hard for me to read. Whitney blamed herself for giving her son Autism. That he came out of her womb so it was her fault. I was born with a congenital disorder myself called Hemidystrophy. All my life I had been thinking the same thing about my Mom. But to hear you say it and me to read it was hard to read. It wasn’t your fault as it was not my Mom’s fault. It just happened. For that I want to give you a hug for making me realize that. There is a reason Zach was born like that. He is a special little man. Who is very blessed to have a Mom like you. I choose to read this book because in High School I had a friend with Asperger’s Disease. That is high functioning Autism. He was the smartest kid and the sweetest boy you would ever meet. I also babysat a little boy and he had a fixation on Elevators. We would watch Elevator video’s on YouTube and he could tell you anything about them. Again, the sweetest most loving kid you will ever meet with a heart of gold. Kids with this have a special place in my heart. Now Zach does too after reading this book. Whitney moved me to tears at the end of this book. I was seriously crying. She wrote this beautiful section just for Zack and it just melted me. Then you turn the pages to amazing pictures of Zack and his beautiful family. You were able to put faces with the names. One of my favorites was on of baby Zack and his Mom Whitney where Zack is putting his little hand on her face. It was so sweet & Nonfiction Authors Association!